Looking for Amish gazebos for sale in your area? Wooden gazebos, vinyl gazebos, rectangle gazebos, oval gazebos, octagonal gazebos, gazebo kits and more can be found via Amish gazebo producers and retailers across the country. This guide includes an Amish gazebo seller directory with over 80 Amish gazebo makers and sellers listed. You can also read more on gazebo designs and styles, gazebo materials or gazebo kits. Gazebos fulfill a number of purposes. They provide a shady place in which to relax on a summer day or enjoy a cool beverages with family and friends. They can be a place for relaxation or picnicking or dodging raindrops of a sudden thunderstorm. And with their often elegant and striking designs, they also make attractive additions to the yard of any home, creating an instant focal point for a garden or backyard. Where to buy an Amish gazebo? 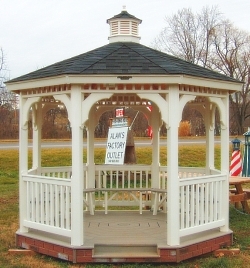 Find Amish-made gazebos in your area via the Amish gazebo state listings below. Amish gazebo producers and sellers can be found in at least 30 states. You can also buy an Amish-made gazebo via an online retailer. Many ship their products completed or in the form of a gazebo kit, which the customer can assemble at home. The following businesses carry Amish gazebos. Please double-check business hours and locations before visiting. Not responsible for changes to information. Amish businesses as a rule will be closed on Sundays. Non-Amish retailers selling Amish gazebos may be open, however. Sacramento area Amish gazebos. Two hour drive from San Francisco Bay area. Amish gazebos within a half-hour from Dover. Within an hour’s drive of the Tampa – St. Petersburg area. Tampa – Lakeland area dealer of Amish-crafted gazebos and other products. Within a 90-min drive of Orlando. Atlanta Amish gazebo seller, along with other products. 20081 N. Depler Springs Rd. Amish-owned business selling retail gazebos as well as mini-barns, cabinets and furniture. One hour west of Peoria, 90 min from the Quad Cities region. Amish maker of gazebos and mini-barns. Retail sales. Located in the large southern IN Daviess County Amish settlement, about 90 minutes from Indianapolis. 90 min north of Indianapolis, a similar distance from Fort Wayne. Northern Indiana gazebo dealer easily accessible from South Bend area. Seller of Amish gazebos half an hour south of Cedar Rapids. Amish producer of gazebos, rustic indoor furniture as well as red cedar, treated pine lawn furniture, located a 90-min drive south of Louisville. Amish gazebo seller reachable within an hour from New Orleans, 75 min from Baton Rouge. Amish-built gazebos and other structures in the Baltimore area. Baltimore area dealer of Amish gazebos and other outdoor structures. Amish-made gazebos a short drive from Annapolis. Within an hour’s drive west of Baltimore. South Boston vicinity Amish gazebo retailer. Amish-built pavilions and pergolas within 45 min of Boston. Amish gazebos located 30 min north of Lansing. Kansas City area dealer of gazebos and other Amish and Mennonite made outdoor structures. Trenton area Amish gazebo dealer. Amish gazebo seller within about an hour’s drive from Newark, Jersey City. Poughkeepsie-area Amish gazebos and sheds. Long Island Amish gazebo dealer. Raleigh – Durham – Chapel Hill – Cary area seller of Amish gazebos and outdoor structures. Amish maker of gazebos, mini-barns in Ohio’s largest Amish community. Toledo area seller of Amish gazebos and other products. Amish manufacturer of mini-barns and gazebos, retail sales. Located in the Holmes County settlement, about a 90 min drive from Columbus. Amish-operated producer of vinyl and wood gazebos, pavilions. Makes custom cupolas as well (vinyl or cedar). Amish producer of gazebos, mini-barns, and outdoor furniture. Wholesale business. Cleveland area retailer of Amish gazebos and other Amish made outdoor products. Philadelphia area Amish gazebos and other Amish made outdoor products including playsets, garages, sheds, pergolas, and more. Experienced Amish maker of gazebos and mini barns. Amish gazebos one hour west of Nashville. Located 2 hours from Dallas – Fort Worth, 3 hours from Houston. Northern VA dealer of Amish gazebo kits. 90 minute drive from Washington DC. Easily accessible from DC area Amish gazebos. Northern VA Amish gazebos and other outdoor Amish-built products. Roanoke area dealer of Amish gazebos and other Amish made structures (cabins, sheds, outdoor furniture). 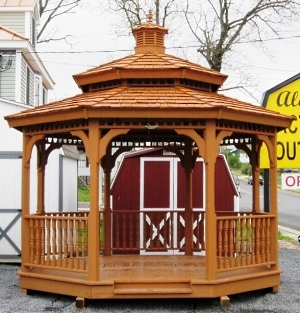 Amish-made gazebos and other products in the Seattle – Tacoma – Bellevue area. 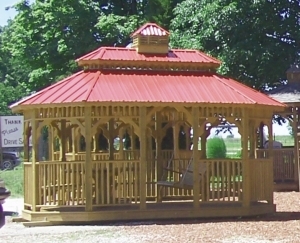 Amish-built gazebos come in a wide range of styles and designs. A number of shapes are available, from the pragmatic rectangular gazebos to the classic octagonal shape to “stretch” gazebos allowing for greater capacity. The octagonal gazebo offers a classic look, elegant with its eight sides, and probably the most popular shape choice. Rectangle gazebos offer a plainer solution with a simple yet attractive, functional design. Oval gazebos are a variety of the octagonal, with an elongated middle. The hexagon is a less common gazebo shape, though also offering an elegant appearance, and available in an elongated version as well. The 12-sided dodecagon gazebo is perhaps the least common shape, often seen in larger sizes. A few materials have proven particularly suitable for the construction of gazebos. 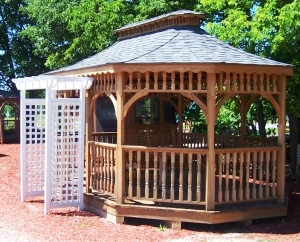 Amish gazebos come in two primary material types, wooden gazebos and vinyl gazebos. 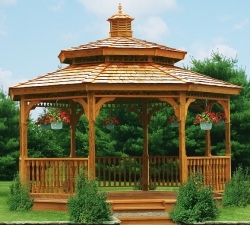 Amish gazebos are primarily crafted from two strains of wood, Western Red Cedar and Southern Yellow Pine. Western Red Cedar– This is a wood which provides strong durability and decay resistance, essential given that the gazebo is an outdoor item. Western red cedar has an especially attractive look. The natural red color will become a light gray as the wood ages over time. Western red cedar can also be stained. Southern Yellow Pine-Another strong and durable wood popular for making Amish gazebos. Southern Yellow Pine benefits from pressure treating and kiln drying to help to prevent shrinkage of the wood. One of the hardest of the pines. Vinyl– the greatest asset of vinyl is first and foremost durability. That said today’s vinyl is crafted to have a very attractive appearance in a range of shades. One popular option comes in the form of the gazebo kit, designed to be shipped and assembled handyman-style by the new owner at home. The gazebo kit allows the structure to be transported at a much lower cost. Since gazebo structures can be quite large (with some gazebos even reaching 20 x 40 foot dimensions) and since much of the completed gazebo is empty space, ordering an Amish gazebo kit can make a sensible, cheaper solution. Putting together an Amish gazebo kit makes a good project for a weekend, and can be done relatively quickly by a handful of people possessing average DIY skills. Alternatively you can hire a professional carpenter to assemble your gazebo kit. Where are Amish gazebos constructed? For the past few decades, a quiet shift has been occurring among Amish across North America. With increasing land prices and jumbo-sized families, Amish have found that buying and maintaining a traditional farm is more difficult than in eras past. Amish have slowly migrated into small business, with many opening manufacturing shops. Amish craftsmen create a wide range of indoor and outdoor furniture, along with an extensive list of outdoor structures, including gazebos, pergolas, sheds, mini-barns, cabanas and pavilions. Amish manufacturing businesses such as furniture shops have exploded in number as the popularity of Amish-crafted products such as gazebos has grown. Amish craftsmen may construct your gazebo in a very small shop located at an Amish home. This truly family businesses may employ immediate family members–sons and even daughters and wives–or extended family or church members from the neighborhood. Some Amish companies have outgrown the small at-home shop model, and may employ even dozens of Amish workers constructing gazebos in a mini-factory-like setting. Amish gazebo builders emphasize top-notch work and high-quality materials, lending their products an appeal capitalizes on the “Amish aesthetic” while pleasing the value-minded. Amish-made gazebos are one popular category of products within the wide-spanning universe of Amish furniture, outdoor products and manufactured goods. We sell and we only carry Amish products . 540-379-8530 ShedsAmishBuilt@Gmail.com If you want it from the Amish we will find it for you.